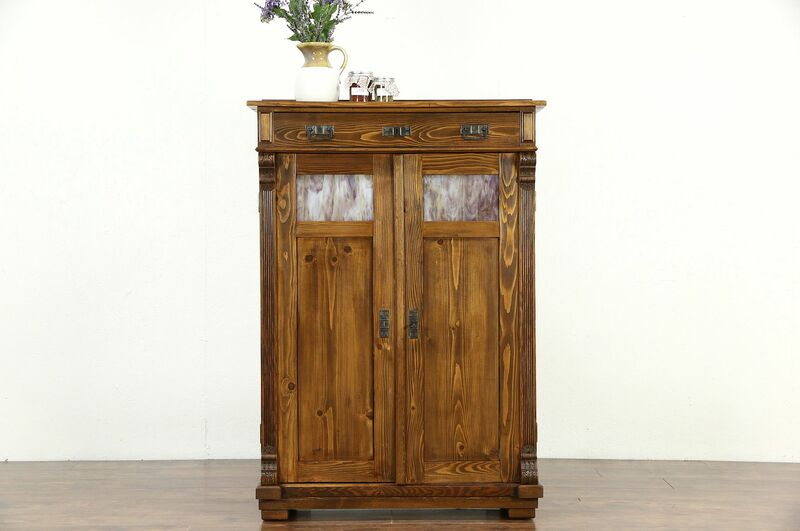 A pine pantry jelly cupboard was hand crafted in Germany about 1900, and has stained glass door panels. The restored finish is in excellent condition on this antique kitchen furniture. Hardware is original, the door lock and key work. Shelves adjust on wooden supports, details are hand carved. Drawers have hand cut dovetail joints, there is no key. Doors have matching warps from age but fit nicely together, see photos. Size is 38 1/2" wide, 18" deep and 56" tall.